Yo-ho-ho! Perfect for pirate parties! 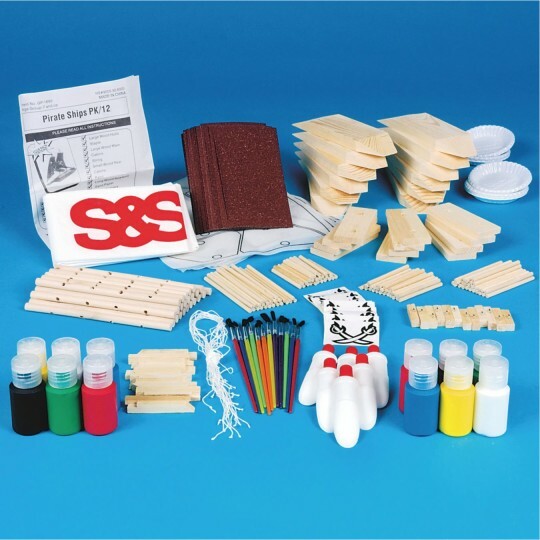 Use for storytelling or creative play. Spin yarns about high-sea adventures! Purchased this to do at camp with Kindergarden boys and thought it would be a snap. It was actually very difficult for the kids to cut the sails as they are very thin and flimsy and even more difficult to put the sails together. It's tricky painting them - if you paint before you assemble the pegs will not go through the masts. If you paint afterward they can't paint around the sails. Often couldn't pull the pegs out of the masts even without painting them. The rest of the ship was sturdy and easy to put together. Even the glue held well although you have to hold the pieces on the front and back for a while till it sets. The finished product looked cute although it was more work on my part than anticipated. Maybe it would work better with older kids. Overall pretty disappointed and will look for something without sails next time. Merchant response: Thank you, we sent your comments to customer service. This customer has been given a gift certificate for their next purchase. 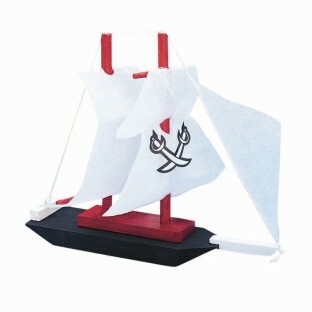 This pirate ship is really fun to make and allows students to work on it for a few days at a time. It is very satisfying to finish. It's a great project and students love it. With lots of help even kindergarten age children can make the ship. The Pirate Ship kit is fun for kids to do. The pieces fit together nicely and the materials included are easy to work with. The paint shown in the ad wasn't what came in the kit. It was tiny containers and not enough for 12 projects. Buying extra paint to complete the project drove the pricing up per project. Children love this project and I loved having it for my summer program because it cannot be completed too quickly. It works well to have children paint or stain the pieces one day then assemble parts on successive days. I found that when children paint the mast pegs it can sometimes be tricky to get them through the drilled holes... coloring the pegs with permanent marker works really well... also younger children sometimes have trouble cutting the sails independently.